If you are bored of wasting a lot of time in waiting and standing in a long queue for the entrance into the famous tourist destinations in Hue, the hot air balloon is a perfect alternative for your choice. Interestingly, Hue ancient city will appear in a new look which you have never seen before. 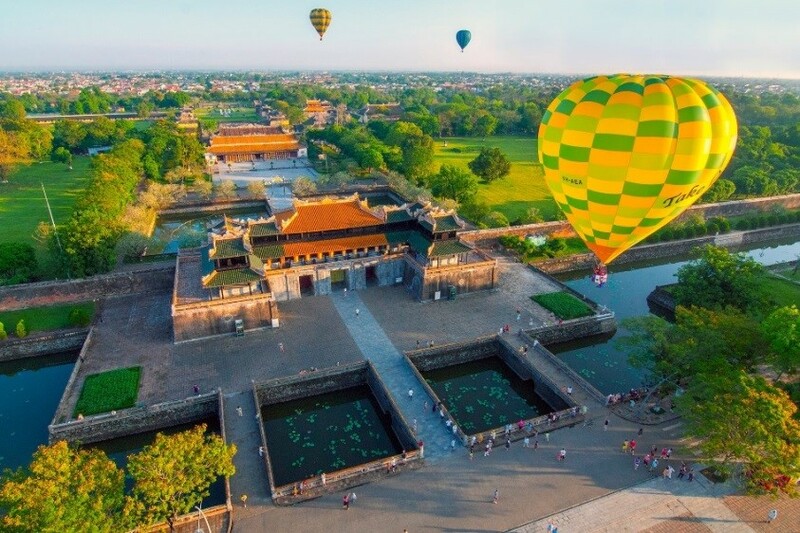 An exhilarating hot air balloon ride will help you to have a bird’s eye view over the historic Hue city, admiring the romantic and rustic beauty of the Citadel, the scenic Huong River, and the pristine surrounding nature. 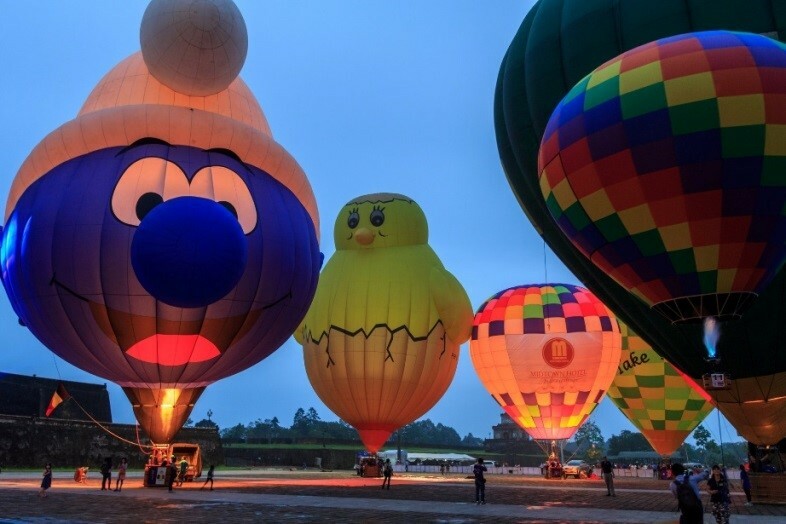 Within the Traditional Craft Festival 2019, the International Hot Air Balloon Festival is a highlight, attracting different professional hot air balloon crews, and pilots all over the world such as Japan, Holland, Thailand, and Malaysia. The brightly colored hot air balloons floating against the blue sky and white clouds is such a wonderful and lovely scene to enjoy. The hot air balloons are designed to fly freely at an altitude of 100-300 meters, and radius of 5km from its starting-off point. Besides, there are also the hot air balloons standing still at the height of 50 km. The mini hot air balloons with various colors and shapes are positioned in Ky Dai for those who love taking photographs. This Hot Air Balloon Festival is organized periodically, aiming to enhance the tourism promotion, and market Thua Thien Hue Province as an exciting destination with various entertainment activities. Joining the Hot Air Balloon Festival 2019 is such an ultimate experience in ballooning, launching the tourists themselves into the pure atmosphere, and enjoy the ancient city below from an exclusive perspective. The unique experience of riding in a hot air balloon safely and comfortably, however, has never been more accessible than now. 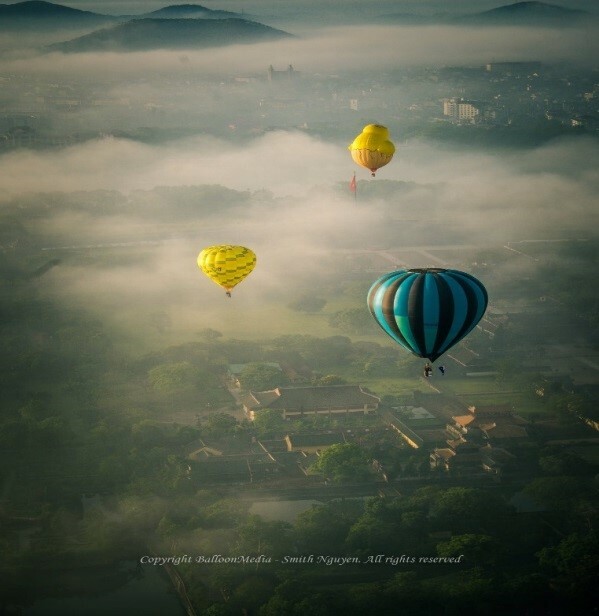 A beautiful hot air balloon ride over Hue City with the greenery of the natural features, river, mountains, the complex of monuments, and pagoda is a must do. In this Hot Air Balloon Festival 2019, you will have a chance to fly with the high-qualified and experienced pilots from different nations. This ballooning event is also well designed in the end of April, and in the beginning of May when the local weather is absolutely able to fully meet all of the flyable weather conditions of a ballooning package flight. The Hot Air Balloon Festival 2019 is dedicated to offering the most professional service to the visitors. In other words, it is committed itself in having always striven to provide the best ballooning adventure, and make the visitors’ flight fantastic fond memories for a lifetime. With no reason or excuse to look for, don’t hesitate to make a ballooning tour, and gain a new appreciation for the beauty and diversity in this summer in Hue. Together with many other famous traditional brocade weaving villages all over the country, traditional weaving of K’ho and Chau Ma people will join and be honored at Hue Traditional Craft Festival 2019 for the first time. Every year, as Tết (Lunar New Year) is coming, the atmosphere of boat racing festivals are bustling along the countryside of Vietnam in general and those of Thua Thien Hue province in particular. On the morning of February 13 (the 9th of Tet), the Huyen Tran Temple Festival in the Spring of the Ky Hoi Lunar New Year 2019 officially opened at Huyen Tran Cultural Center (Ngu Phong Mountain, An Tay Ward, Hue City). This is one of the activities of a series of cultural events, and festivals celebrating the Party and the Spring. The 8th Hue Traditional Craft Festival will take place in Hue City from April 26th to May 2nd, 2019 under the theme “Quintessence of Vietnamese Crafts”.